The abduction of an Irish heiress occurs in my next novel, a prequel to Sharavogue, so I have been looking into this practice which, for men, was a rather acceptable means of elevating one's station in life. Not surprisingly, the heiress abduction theme has been a favorite for the ages among romance writers and those studying legal history. 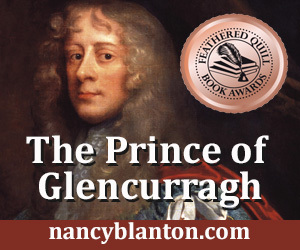 On a quick search I came up with historical fiction/romance authors Amanda Scott, Claire Thornton and Paul B. McNulty focusing on this theme, plus numerous scholarly articles. I'm sure there are countless more. As part of my research I just finished reading The Abduction of a Limerick Heiress by Toby Barnard. I think the picture on the cover tells the story -- the woman as ornament, possession and plaything (according to the fellow on the left with the come-hither finger), but the look on her face suggests she is at times complicit. In this case, the heiress Frances Ingoldsby is abducted not once, but twice. Her family pulls her away from the first fellow (and she is glad to go because he is already having affairs with household servants). While the fellow claims to have married Frances, her family presumes the marriage illegal and not consummated, and hides her away in a rectory. From there she is again abducted by a fellow of slightly higher standing in the community, Hugh Fitzjohn Massy, who aspires to a gentleman's status. Massy soon realizes he has his hands full, because Frances is a bit of a belligerent alcoholic, and he requires his entire family to keep her in check and support his scheme. Soon the agendas of all who believe they have a stake in Frances's inheritance start playing out, and family members with political standing exert pressure on the lawyers and judges to ensure their own profitable outcome. With abductions, once the crime had been done in most cases the family did not fight too hard for the woman's return, because it was assumed the heiress had been, shall we say, "damaged" by the abductor and they would have difficulty finding her a suitable husband once she was back on the marriage market. So it came down to negotiating the best deal for the stakeholders. Poor Frances, treated like the prize pig. In the end, she willingly marries and has a son by Massy, but in fact the story continues. When Frances dies, the maneuvering begins anew, the same arguments are revived, and the fight is on for her inheritance. In her book, Stolen Women in Medieval England, Caroline Dunn writes that abductions, sexual violations and elopements were all classified as "thefts" in statute law at the time. (See review by Emma Osborne.) As Julia Pope points out, it was not the victims themselves who were seen as stolen property, but rather the lands and wealth that would be transferred through them. The crime of abduction was taken very seriously, and resulted in courtroom battles and sometimes more violent responses, but the heiress did have a bit of sway. Under 13th century law, if the female victim did not consent to the marriage, or consented after the fact, the criminal punishment remained the same. However, if she had consented in advance of her abduction, no crime had been committed. Blogger Susanne Saville writes about a more recent event, the 1826 abduction of 16-year-old Ellen Turner in Scotland. Her abductor convinced her that only by marrying him could she save her family from the poor house. Thus, she unwittingly consented, and it took an act of Parliament to annul the marriage. The abductor was convicted of the crime and spent three years in prison. In the PBS Masterpiece series Downton Abbey there have been two abductions. Between Lady Sybil and the chauffeur Branson, it is actually an elopement because Sybil is consenting, and the family persuades them to return to the castle together where Branson's status is elevated. In another episode -- horrifying to me as a Labrador retriever owner -- Thomas the footman abducts Lord Grantham's dog Isis in hopes of being seen as a hero when he later rescues the dog. Someone else finds and returns Isis, but Lord Grantham, seeing the deeply concerned Thomas after an all-night search, mistakes his fear for loyalty. The lesson for a storyteller? There are a thousand ways to go with the abduction theme, and all of them can be dramatic and interesting!